I am a general dental practitioner with about twenty years of experience. I am mostly a restorative dentist who has been using composite resin extensively with a direct and indirect approach and as a restorative material after root canal treatment, that is a large part of my activity. I received a pre-production sample of the Anchor composite resin and I tried it on several clinical cases during a period of about four weeks. What follows is an honest review, and I make it clear in advance that I am not in any way financially related to the group of people involved in the project. The choice has been to have a sensible number of dentin shades and just two shades of enamel. This is in line with other popular composite resin in the market and gives a relatively easy shade guide to pick our colour from. The relatively small number of shades available make it easy to pick your resin. The material is excellent for being easy to handle: it does not stick to the instrument and can be sculpted quickly and effectively. The downsides becomes apparent after final polishing: it can be polished up to a point but with less luster than other brands, due to the well known weakness of hybrid resins compared to microfilled. The bottom line: works well for small/average class 3, less for large class 4. This is where the Anchor gives its best. After proper isolation restoring posterior teeth, even large cavities, is really simple and straight forward. The use of sectional dental matrix allows to get a tight interproximal contact all the times, and a simple two layers technique (one dentin and one enamel shades) results in excellent aesthetics. The easy handling reduces considerably the operative time: thumbs up! Being root canals a large part of my activity the problem of restoring the tooth with an alternative to a full crown, often for financial issues, is a recurrent dilemma I share with many colleagues. The ability to complete very large composite restoration in a reasonable time suggested to me to try to build onlays with a direct approach: I have to say it was feasible and not in the boundaries of “heroic dentistry”. It definitely helps to make root canal easy and effective compared with dental implants. One of the most challenging clinical situations is the restoration of endodontically treated teeth. To understand why this is so controversial we have to think of some of the facts associated with a tooth that need such procedure. A Root Canal Treatment is mostly required when a tooth has been badly weakened by severe decay or trauma. That means a significant loss of tooth structure from the very beginning. Following the Root Canal a further amount of dentin could be sacrificed to gain the straight line access that is the starting point of modern Endodontics (the technical aspect of RCT are not the subject of our writing but you can follow the link to learn more about Root Canal ). Is Composite Resin an adequate material to restore these kind of teeth? The answer is controversial to say the least. First of all we have to understand a basic difference between anterior and posterior teeth. are subject to predominantly shear occlusal forces, which act on both the crown and the root. The goal of the restoration is to be retained in place but also, if possible, to increase the strength of the complex. To this purpose a huge variety of posts can be bonded inside the prepared root canal. Generally a simple composite bonded resin suffices if no crown has been planned. If a full crown is the chosen restorative solution the suggested approach is to finalize the preparation and then assess if the remaining tooth structure is adequate for a simple bonded composite resin or a post is indicated. In both cases composite resins are a valid alternative to the more expensive cast metal approach. The clinical steps do not require any particular skills. instead are the subject of predominantly vertical forces, therefore the use of intraradicular post is not indicated if not to improve retention of the restoration as a whole. The ability to bond to the dentin. 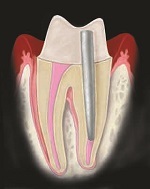 together with some wisely placed undercuts in the pulp chamber is usually enough to keep the complex in place.However in the case of posterior teeth the literature is in general agreement that a full cusp coverage restoration is required, in order to prevent catastrophic fracture almost invariably at pulp chamber floor level. In the case of a direct restoration this is a tough challenge for a fair number of clinicians. Dental Composite Resins today are an effective way to restore the missing tooth structured when damaged by decay, trauma or other in a way that is predictable, efficient and, last but not the least, affordable for most patients. The constantly increasing demand, from the patients and the dentists, have pushed the manufacturers to develop composite systems that offer a huge range of options in terms of shades, translucency, and aesthetic effects. In the hands of skilled clinicians the science of direct resins restoration has evolved in a form of art. 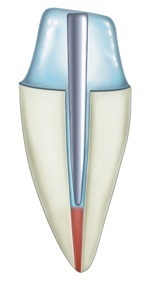 The multiple layers technique involves building up the tooth using different increments, to exactly match the anatomical structure of a natural tooth. If you are curious about what can be achieved watch the video below. Dr Smithson and Cosmodent are not in any way related to the Anchor group. The use of composite resin has become widespread in restorative dentistry thanks to the improvement of the bonding techniques. We call bonding procedure the various steps we take to achieve a chemical adhesion of the filling material to the natural tooth structure. In order to understand the complexity of the problem we have to explain the fundamental differences between the enamel and the dentin. The Enamel is the external layer of a natural tooth, is mostly inorganic and with a minimal amount of water within. Bonding to the enamel has been well known and accepted from the eighties. The adhesion is basically obtained applying an acid gel (mostly orthophosphoric acid) at various level of concentration (30/40 %) for a variable length of time (15/30 sec) to the tooth surface, washing it away and drying it. Doing so we create at microscopic level a huge number of irregularities that will be filled by the hydrophobic molecules of the composite resin, generating a very effective mechanical retention. On the contrary the Dentin has a significant amount of organic components, cells and collagen fibres mostly, arranged in a tubular structure, with a considerable amount of fluids: not a good match with the hydrophobic nature of the composite resin. The breakthrough happened when we started to condition the dentin surface with acid agents similarly to what we used to do with the enamel (total etch), and we developed some molecule called primers, with a hydrophilic end able to penetrate the collagen fibres and the dentinal tubules, and a hydrophobic end able to connect to the composite resin.Today the successful bonding involves the creation of a hybrid layer that can infiltrate the collagen fibres and penetrate the dentinal tubules at one end, and connect chemically to the composite resins at the other. A huge number of commercial products have been launched on the market in the last twenty years: some are based on a 3 components approach, Etch, Prime and Bond; others just two: Etch and Prime/Bond or Etch/Prime and bond. Recently several products claim to achieve the goal with a single component. An objective comparison in terms of efficacy is difficult and all the approaches are very technique sensitive. The Matrix : the basic phase to which the other elements are added. The Filler : generally particle of some type of glass to improve physical properties. The Coupling agent : a silane to promote adhesion to the matrix. The initiator : activates the polymerization by chemical reaction or exposure to a blue light. The size and the total amount of the filler particles is the element that has the most significant impact on the Dental Composite Resin properties and its clinical performance. During the polymerization (transition from a soft to a hard state) the material shrinks. 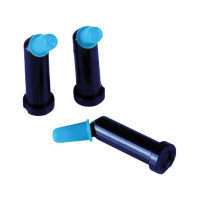 Reducing the amount of matrix and increasing the filler components reduces shrinkage up to a point where the mass is too dense and cannot be clinically handled. Shrinkage has practical consequences, such as transferring of tensile forces to the tooth or detachment of the filling from the cavity with gaps formation. The size of the particles affects other properties: extra small particles (microfilled) can be polished to the higher luster with excellent aesthetic outcome but have generally inferior mechanical properties; bigger particles (macrofilled) are much stronger but tend to degranulate during finishing and therefore the fillings end up with a rather dull final look. It is evident that there is not a perfect recipe and a lot of different approaches have been tried during the years. The modern trend is to use a highly variable mix of particle sizes (Hybrid) wich offers a good compromise of strength and aesthetic properties. The sizes and proportion of this mix is an individual choice of single manufacturers with the so called Nanohybrid being the last trend. The combination of a moder Hybrid composite, the last bonding technique, and the hand of a skilled clinician, offer a valid restorative option for most of the cases at a very competitive price.